I am trying to apply high speed photography. 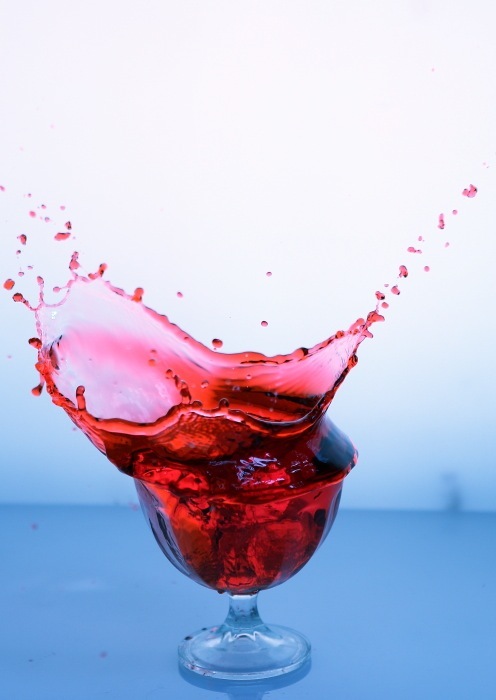 In this still life photo season, my friend drop an ice cube into a glass of red syrup. Then, I allow my camera to shot several frames per second. I call it sewing machine effect photography because my camera will sound like sewing machine during photo shot. I am using my Canon EOS 40D and Canon EF 24-70mm f/2.8L USM Standard Zoom Lens . That is a very neat effect. How do you do that? I love your phrase for the sound of a camera in servo mode. Brilliant. Hi. Nice effects. My experience is that if you drop the object yourself and use a remote shutter cable, you will have a better sense of timing and control. I do that way and it works good after a few shots. I like that you seem to achieve excellent splash effects with a minimum equipment setup. An amazing photo. Thank you for stopping by my blog. Hope you visit again. Thank you for visiting my blog and for your honest comment 🙂 I like your quote.